Leslie DeChurch is Professor of Communication Studies at Northwestern University. Her research is being used to improve teams engaged with scientific innovation, military-civil cooperation, humanitarian aid & disaster response, health care, and deep space exploration. Professor DeChurch was awarded a prestigious NSF CAREER award to support her work on team leadership. 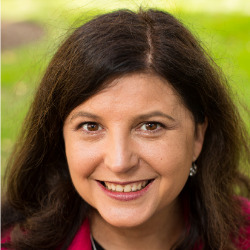 Her research on organizational teamwork has been supported by more than $8 Million in extramural funding from national and international research agencies and foundations including the: National Science Foundation (NSF), National Aeronautics and Space Administration (NASA), National Institutes of Health (NIH), Bill and Melinda Gates Foundation (BMGF), Army Research Institute for the Social & Behavioral Sciences (ARI), Army Research Office (ARO), and Agence Nationale de la Recherche (ANR; France). Professor DeChurch is the President of the Interdisciplinary Network for Group Research (INGRoup) and Fellow of the American Psychological Association (APA), American Psychological Society (APS), and the Society of Industrial and Organizational Psychology (SIOP). She serves on multiple editorial boards and recently served on a National Academy of Science consensus study to set forth a scientific agenda for the next decade of organizational research. Her research on teams and leadership appears in top journals, some of which include the Proceedings of the National Academy of Sciences, Journal of Applied Psychology, Journal of Management, Organizational Behavior & Human Decision Processes, and Leadership Quarterly. Professor DeChurch earned a B.S. in Environmental Science from the University of Miami in Coral Gables and an M.S. and Ph.D. in Industrial and Organizational Psychology from Florida International University in Miami. Her passion for understanding and improving team leadership was seeded by her many early mornings on the water as a coxswain for the University of Miami’s Women’s Crew.